Heat oven to 375ºF. Generously grease bottom of loaf pan, 9x5x3 inches. Stir Bisquick, granulated sugar, sour cream, oil, milk, orange peel and eggs in medium bowl until moistened. Stir in cranberries and nuts. Pour into pan. Bake 45 to 50 minutes or until toothpick inserted in centre comes out clean. Cool 15 minutes. Loosen sides of loaf from pan; remove from pan and place top side up on wire rack. Cool completely, about 2 hours, before slicing. Wrap tightly and store at room temperature up to 4 days, or refrigerate up to 10 days. Stir icing sugar and orange juice until smooth and thin enough to drizzle. Drizzle over bread. Tip: When grating orange peel, be sure to grate only the orange part of the skin. The white part, or pith, is very bitter. 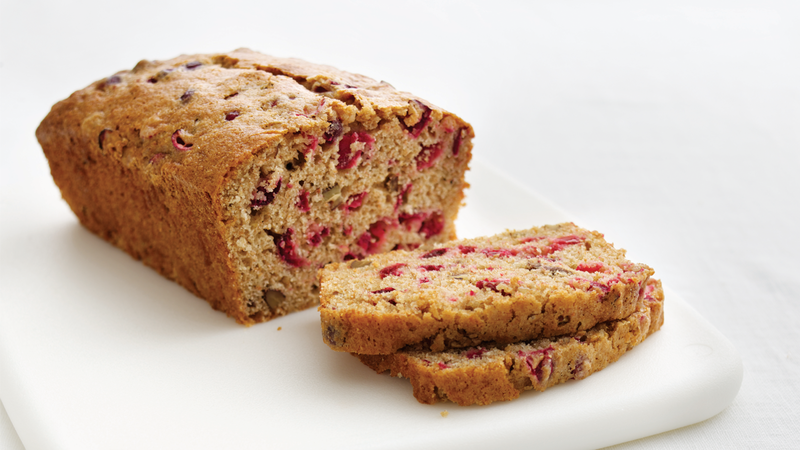 Tip: Fresh cranberries are available only during the fall and early winter. Why not buy a few extra bags to keep in your freezer? You can freeze them for up to a year. Tip: To avoid ledges on the edges of your quick bread, grease only the bottom of the baking pan. A fully greased pan prevents the bread from forming a nicely rounded top. Tip: Go nuts! Walnuts, pecans and cashews are perfect for this quick bread. Pick your favourite. Tip: If the loaf sticks to the pan, press gently on the sides of the loaf with a knife or metal spatula to loosen.